UCSD Writing Requirements: Who Has It the Hardest? Each of UC San Diego’s six undergraduate colleges has its own writing program with differing numbers of units and learning outcomes required of students, inspiring countless arguments over which is the most difficult. Drawing from public records providing writing programs’ grade distributions from the past several years, the UCSD Guardian settles the age-old debate: Which college has the hardest writing sequence? Whether you’re a science, technology, engineering, mathematics, or humanities major, transfer or non-transfer student, international or local, one thing is for certain: You will take writing courses during your time at UC San Diego. Writing requirements can be expected at any university, but what sets UCSD apart is the fact that students must complete different writing sequences based on their college. Through their particular writing curricula, the six colleges emphasize their philosophies and foster the types of scholarliness they hope for their students to achieve. John Muir College, for instance, features a two-course writing sequence for non-transfers and one course for transfer students. Muir College Writing Program students learn the elements of argument and analysis, completing analytical essays and research papers relating to a central topic. The Earl Warren College Writing Program similarly requires non-transfers to complete two writing courses and transfer students to complete one. It focuses on the ability to make academic arguments, providing students with a strong research foundation. Like Muir, its courses are centered on a certain topic. Thurgood Marshall College’s Dimensions of Culture Program requires a three-course writing sequence exploring the topics of diversity, justice, and imagination. While the first course is worth four units, the second and third are heavily writing intensive, six-unit classes. DOC not only strengthens students’ writing and research skills, but also their understanding of history, politics, and culture. The Culture, Art, and Technology Program is Sixth College’s writing sequence. It requires a total of four writing courses examining the intersection of culture, art, and technology. Sixth College is also the only college to require a Practicum, which is any department-approved, four-unit, upper division course that features hands-on learning and a final project. 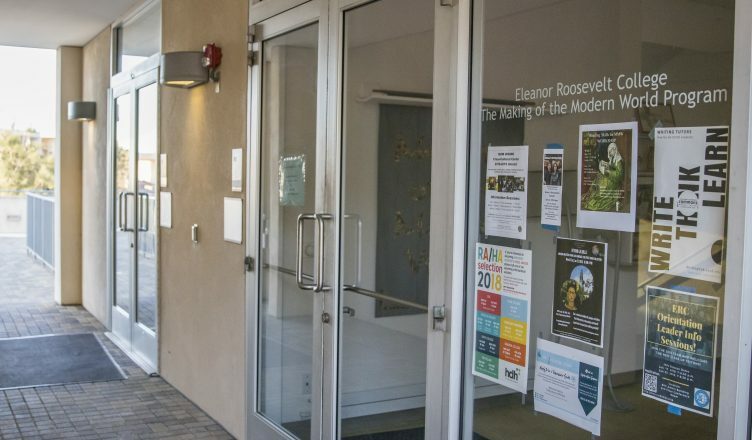 In stark contrast to Muir and Warren’s two-course sequences, Eleanor Roosevelt College’s writing program, Making of the Modern World, requires a five–course sequence for non-transfers and a two-course sequence for transfer students. These courses span the history of human civilization from pre-history to the 20th century. Finally, Revelle College’s Humanities Program is, like ERC’s, a five-course sequence focusing on subjects such as literature, history, and philosophy. In each course, students examine humanities disciplines from time periods ranging from Ancient Israel and Greece to modern Western civilizations. While Revelle students who entered as freshmen in Fall 2016 or earlier have the option of transferring two approved courses from another institution, the incoming class of 2017 and beyond may only transfer one course. In terms of the number of units required of each student, the ERC, Revelle, and Sixth College writing programs are the most rigorous, all being tied at 24 units. A five-quarter writing sequence also arguably takes up valuable space in students’ graduation plans — time that could instead be spent on classes students are actually interested in, or electives that would boost one’s resume. The Muir and Warren writing requirements are also tied for the least rigorous at eight units. Marshall’s requirement falls in the middle at 16 units. In terms of the average class GPA of all courses within each writing sequence, however, Revelle’s humanities sequence appears to be the most rigorous. Based on grade distributions obtained from Course and Professor Evaluations results and public records requested from UC San Diego’s Policy and Records Administration, the average class GPAs of each HUM course from Fall 2007 to Spring 2017 is 2.918. In spite of its low unit requirement, Muir holds the second lowest GPA with 2.964. ERC places third with an average GPA of 3.134, followed by Warren’s 3.197 and Sixth’s 3.231. This renders Marshall the college with the least rigorous in terms of GPA with an average of 3.235. Although GPA is an indicator of students’ general academic performance, it is also influenced by the different instructors and teaching styles of each writing program. For example, while DOC courses feature both lectures and discussions and have TAs grade students’ papers, MCWP classes are seminar style courses led by one instructor who grades all of their students’ work. In courses where students’ grades vary greatly among instructors (such as CAT 1, which ranges in GPA from 2.718 to 3.57), the average GPAs are more representative of the graders’ difficulty than the difficulty of the writing sequence as a whole. Since the average GPAs of Revelle’s HUM classes are consistently lower than the other colleges and less variable, we can conclude that the writing sequence is difficult for students due to both the harshness of the grading and the heavy workload. An anonymous Revelle sophomore even felt that HUM is so difficult it places students at an unfair disadvantage. MMW and CAT classes may be just as difficult as HUM in terms of the number of units required, but HUM students are more likely to score lower writing grades. While MCWP and WCWP are worth the same number of units, WCWP students are more likely to score better grades than MCWP students, which points to harsher grading within Muir’s writing program. So which college has the hardest writing sequence? Based on both the number of units required and likelihood of scoring a high grade, Revelle’s Humanities sequence is undoubtedly the most difficult for UCSD students. However, the definition of difficulty in the context of writing sequences is subjective — some students may find MMW’s history-centric subject matter harder to grasp than that of the HUM sequence. For example, Revelle junior Sydney Preston did not find the HUM sequence unfairly difficult, and thoroughly enjoyed her experiences in the courses. Despite the HUM sequence being, in general, the most rigorous writing requirement, it is also the only writing sequence that allows non-transfer students to fulfill their credits at another institution. This gives Revelle students the advantage of potentially scoring a higher HUM grade elsewhere, but when solely comparing grades received at UCSD, HUM is the most difficult. It is harder to judge which writing sequence is the least rigorous. While WCWP requires less units than DOC, students have scored higher grades in DOC than in WCWP classes. Either way, both Warren and Marshall’s writing programs fall on the easier side of the spectrum. While it is understandable that the six colleges have individual writing requirements designed to fit their philosophies, certain programs consistently scoring lower GPAs than others shows that these differences exist for reasons beyond students’ control. Instead, they arise from some programs having heavier workloads and harsher grading systems than others, showing that UCSD GE requirements do not offer a level playing field for students. It brings forward the possible necessity of changing a long-standing system that seems to give some a leg up and others hours of stress at the library. ERC students are known campus-wide as being the best writers. I think that answers your question.